A delegation of Tamil Tiger rebels has left Sri Lanka for a three week tour of Europe aimed at putting pressure on the government to resume peace talks. The leader of the Tigers' political wing, SP Thamilselvan, says they will urge European governments to withhold aid until talks start again. The tour comes as fighting between the mainstream Tamil Tigers and a breakaway rebel group continues. Diplomats say the fighting is hampering efforts to revive the peace process. "Any aid not tied to progress in the peace process will be detrimental to Tamil people," Mr Thamilselvan said on the pro-Tamil Tiger website, Tamilnet. "We believe that only when aid is denied will the government of Sri Lanka be forced to take forward steps in the peace process." It was the Tigers who broke off peace talks in April last year. An official ceasefire has been in place since February 2002, brokered by negotiators from Norway. Sri Lankan President Chandrika Kumaratunga says it is the rebels' fault that the talks have not resumed. The Tigers blame her for the impasse. Mr Thamilselvan will lead the Tiger delegation that is due to visit Switzerland, Norway, Ireland and Denmark. It will meet representatives of European governments, the United Nations as well as European-based Tamil groups. The talks are due to open in the Swiss city of Geneva on Friday. Recent days have seen renewed clashes between the Tigers and a breakaway group led V Muralitharan, also known as Colonel Karuna. However, the Sri Lankan military has been unable to confirm reports that six mainstream Tigers were killed in a clash with Colonel Karuna's fighters in the eastern Batticaloa region on Tuesday. The reports said a civilian was also killed in crossfire. 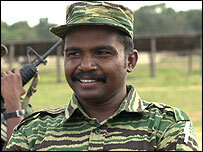 Colonel Karuna split from the main Tamil Tiger organisation in March. The mainstream Tigers accuse the government of supporting him. Colonel Karuna says Tamils in eastern Sri Lanka are being discriminated against by the Tiger's northern leadership. The Tigers have been fighting for a homeland in the north and east of the island for minority Tamils for more than two decades. About 60,000 people died between 1972 and 2002 in the island's civil war.